Oppo, the China-based smartphone manufacturer is all set to launch the new ‘Reno’ series of smartphones in China on 10th April. Now, it’s confirmed that the company will be launching at least two smartphones at the event. Along with the Oppo Reno Standard Edition, the company will also be launching Oppo Reno 10X Zoom, which is expected to cost between $602 to $645. The phone’s key specifications have also leaked. As the name suggests, the Oppo Reno 10X Zoom edition will come with support for 10x zoom capabilities. It is expected to have triple camera sensor on the back, featuring 48 MP main sensor and a 13 MP and 8 MP snappers. The phone will be featuring an OLED display but the exact screen size is not yet known. Under the hood, the device will be powered by the Qualcomm Snapdragon 855 octa-core processor, coupled with 8 GB of RAM and 256 GB of internal storage. It is said that the phone will measure 162.0 x 77.2 x 9.3mm and weigh 215 grams. The device will be running Android 9 Pie operating system out of the box with the company’s own ColorOS 6.0 on top. The phone is already confirmed to have 93.1% screen-to-body ratio. Considering that the phone won’t be having a notch or cut-out on top of the display and still offer high STB ratio, it is likely to come with a pop-up front-facing camera. 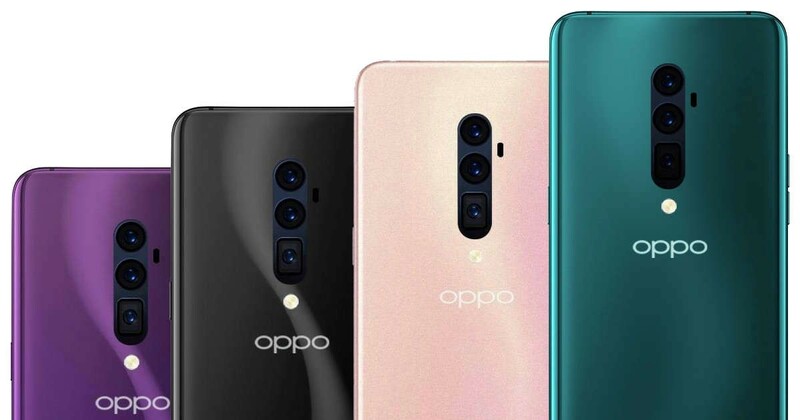 Launching on 10th April in China, the all-new Oppo Reno series is expected to be available in four different color options — Sea Green, Midnight Black, Pink, and Nebula Purple.